The Chief Executive of Lincolnshire's Primary Care Trust has admitted the ambulance service in the county is below standard. John McIvor said he wanted to see an improvement in the service as national response targets for ambulances were being missed. 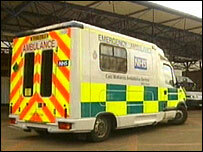 East Midlands Ambulance Service was extended to cover the county in 2006. An EMAS spokesperson did not respond directly to the PCT claims but said its performance was on an upward curve. EMAS was awarded a £1m bonus for being the most improved UK ambulance service in March. Ambulance trusts are expected to respond to 75% of category A emergency calls, such as heart attack victims, within eight minutes by April 2008. Mr McIvor said in the first quarter this year, the amount of those calls which were responded to within target time in Lincolnshire was 73%. He added: "As a PCT, as the buyer of those services, we want that to improve. "We've invested more money this year in new ambulances, new cars, more paramedics. That investment went in on 1 April and we'd like to think that some of that would have an effect now." An EMAS spokesperson said in a statement: "Our Lincolnshire division delivered category A performances of 77% the week before last, 80% last week and the week to date is running at 82%. "This progress is down to two major factors; the commitment of our staff, who work hard on behalf of people throughout Lincolnshire and close working with the primary care trusts who commission our services and made additional funding available to us this financial year. "This... is making it possible for us to employ an extra 57 to 60 staff in Lincolnshire later this year ... we anticipate continued improvement in our performance figures and in the range of services that we deliver to the people of Lincolnshire." Mark Furneaux, UNISON representative for the ambulance service in Lincolnshire, added: "We have a really large area to cover but the staff are working very hard and we are getting a lot better." EMAS, which originally covered Nottinghamshire, Leicestershire, and Derbyshire, was expanded last year to include Northamptonshire and Lincolnshire.